At last! A good piece of science fiction film. 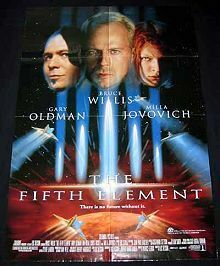 Well, okay, Fifth Element may not be a piece of break-through cinematic history, but it is definitely worth a couple of hours of your life. Fifth Element reminded me overwhelmingly of the best of Barbarella -- stylish, colourful, camp, over-the-top, unwilling to be perfectly serious, edgy. Bruce Willis plays his usual smart-mouthed loser-with-a-hammer fist who gets the girl in the end (what? You think that would be a surprise ending?). He dyes his hair blond, but its Mr-man-with-a-gun-and-an-attitude. The leading lady is a wonderful surprise, a wonderful-looking woman (she has to be) -- perfect, they say. Because SHE is the saviour. It's a nice touch. The music is excellent. The incredibly stylised black raging heterosexual newscaster is beyond good. The movie travels are a wonderful pace. Good costumes, fun sets, and very, very well cut. Two films would-be film-makers should check out for camera work and cuts are Fifth Element and KUFFs (get the video). It's about time we let people with a sense of humour and a sense of wonder and a love of film (more than the money and the hype) get their hands on the millions needed for a project like this. RUN, don't walk, to the ticket office.